Errors in construction procedure were the main cause of the 13-floor building toppling in Minhang District of Shanghai, local government officials said Friday at a press conference. Workers piled excavated earth up to 10 meters high on the north side of the building at Lotus Riverside complex while digging a 4.6-meter underground garage at the south side of the building at the same time. The pressure on both sides moved the foundations horizontally and they were unable to support the building, Huang Rong, director of the Shanghai Construction and Communication Commission, told a press conference. The building toppled at about 6am on June 27, killing one worker. 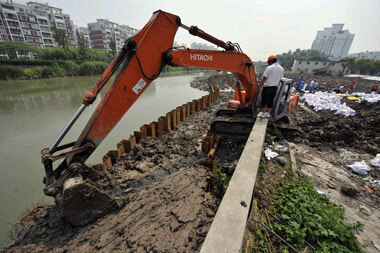 There was no problem with the geological survey, design or construction materials, officials said. After three days of emergency work, the garage has been filled with earth and the pile of earth outside is now only half a meter high. The surrounding apartment houses have been declared structurally sound and safe, local media reported citing officials at the press conference.